Nope! 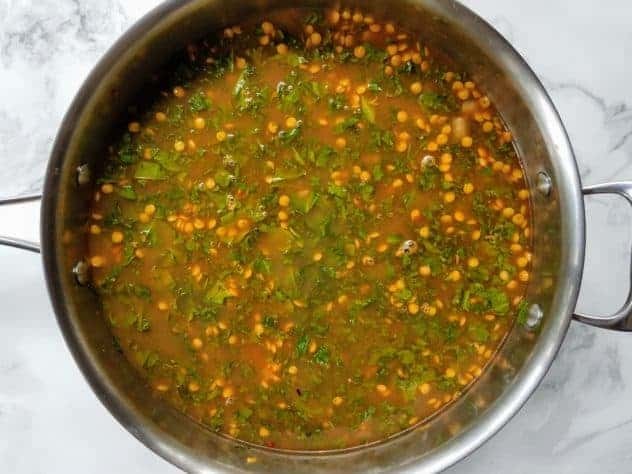 Lentils do not need to be soaked prior to cooking them. For cooking, you can either cook them in water or broth, and eat them as is. Or you can cook them as part of a larger dish that uses water or broth, like this recipe does. Lentils also serve as a nice canvas for a variety of spices and herbs, which is why they are so versatile. They can. Lentils are a great source of fiber. A single serving yields 10g of fiber! 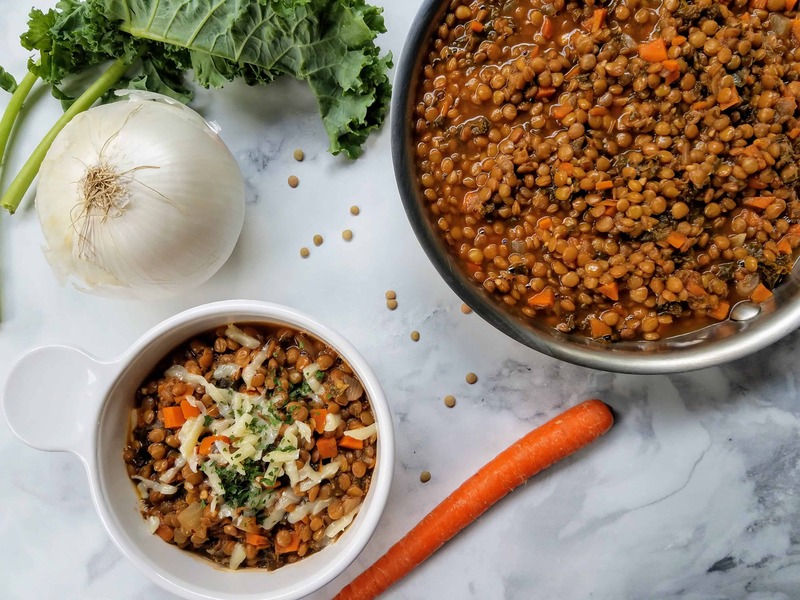 If your diet is typically very low in fiber, and you make a meal with lentils, it might be a shock to your system, and result in a little more gas than normal. Personally, I have never had any issues with this :). If you try them and encounter a problem, cut back how much you are eating. Then gradually increase the amount of lentils you are eating until your body adjusts. The health benefits of lentils are numerous. Due to time and space, I will only discuss four of them here. The first is that they promote intestinal regularity. This is because a single serving contains 10g of fiber, which is roughly half the RDA for women (25g if you’re between 18 and 50 years old, and 21g if you’re over 50). Fiber helps to bulk up waste products in your body and prevent the resorption of water back into the colon, which makes it easier to expel waste. The second, is that they are helpful for weight loss because of their high protein (11g/serving) and fiber content (10g/serving) which keep you fuller, longer. The third, is that they promote energy. A serving of lentils contains ~15% RDA of iron. A common cause of chronically low energy levels, particularly for women, is low iron levels. Iron is an essential component of hemoglobin, and hemoglobin helps red blood cells to properly oxygenate. Without adequate levels of iron, you will be in a state of poor oxygenation, which will cause fatigue. The fourth and final one that we will discuss, is that lentils help regulate blood sugar levels. Thankfully, there are 0g of sugar in lentils, so you won’t have to worry about sugar crashes after ingesting them. In addition, the 30g of carbohydrates that are contained within a serving of lentils are slower digesting. There are four different types of carbohydrates: sugars, sugar alcohols, starches, and dietary fiber (which can be further broken down into soluble and insoluble). 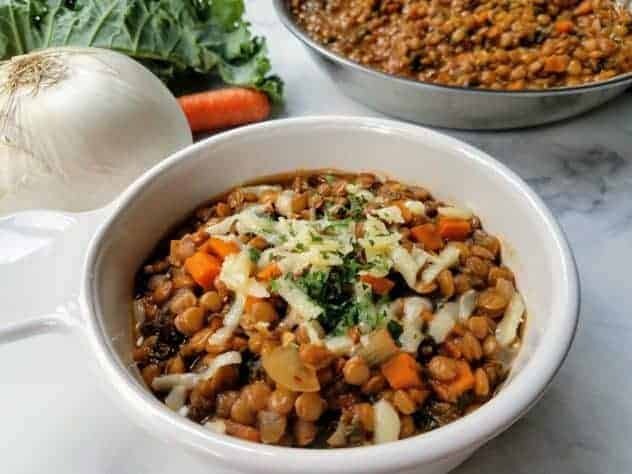 Since there are 0g of both sugar and sugar alcohol, that means that the carbohydrates found in lentils are strictly starches and dietary fiber. Although the starches are slower digesting to begin with, the fiber will further slow down the rate at which the broken down starch will enter your bloodstream. With only a small amount of sugar entering into your bloodstream at a time, this gives insulin a better chance of doing its job correctly. How long can you keep dried lentils? The current recommendation is to use dried lentils within one year. However, if lentils are ever exposed to dampness or insect activity, discard immediately. 1. 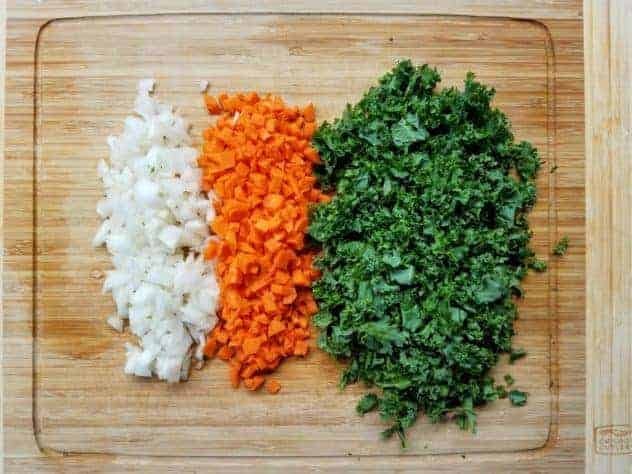 Dice the carrots, onion, and roughly chop the kale. 1 cup of diced carrots is roughly two medium-sized carrots. 2. Add the garlic, tomato paste, paprika, cumin, red pepper flakes, salt and pepper. Cook for 1 minute. The red balls in this photo are actually frozen tablespoons of tomato paste (…with some ice crystals!). Ever notice how a recipe only ever calls for a few tablespoons of tomato paste at a time? 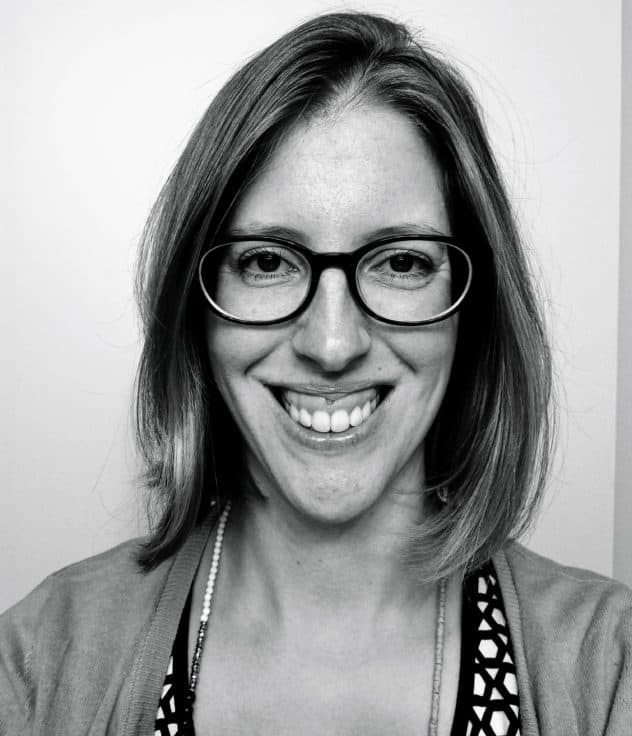 For most people, they scoop out what they need and then waste the rest. But there’s a better way…freeze it! 🙂 To freeze, line a small baking sheet with wax paper. Using a tablespoon, scoop some tomato paste from the can, and then transfer it to the baking sheet making sure the balls aren’t touching. Place the baking sheet in the freezer for an hour or two, or until they are frozen solid. Then transfer them to a labeled freezer bag. Not only do you save a little bit of money, but it is one less step you’ll have to do for the next recipe that calls for tomato paste! 3. 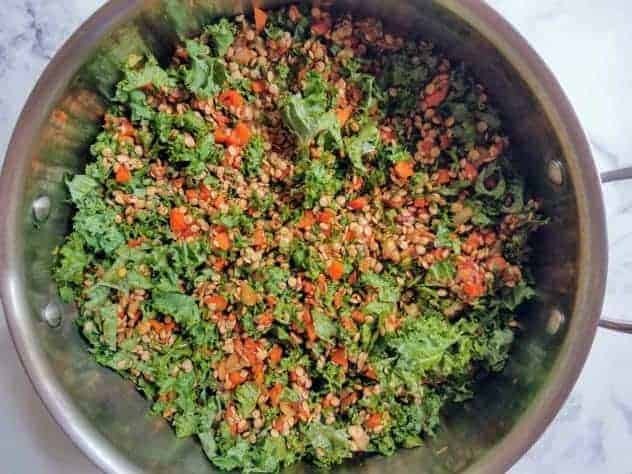 Add the kale and lentils. Cook for 2 minutes or until the kale looks wilted, stirring frequently. 4. Add in the vegetable broth and water. Bring to a boil, then reduce heat to low-medium to simmer uncovered for 30 minutes, or until lentils are tender. 5. Scoop into bowls and if desired, garnish with toppings such as bacon, sharp cheddar cheese, parsley, etc. 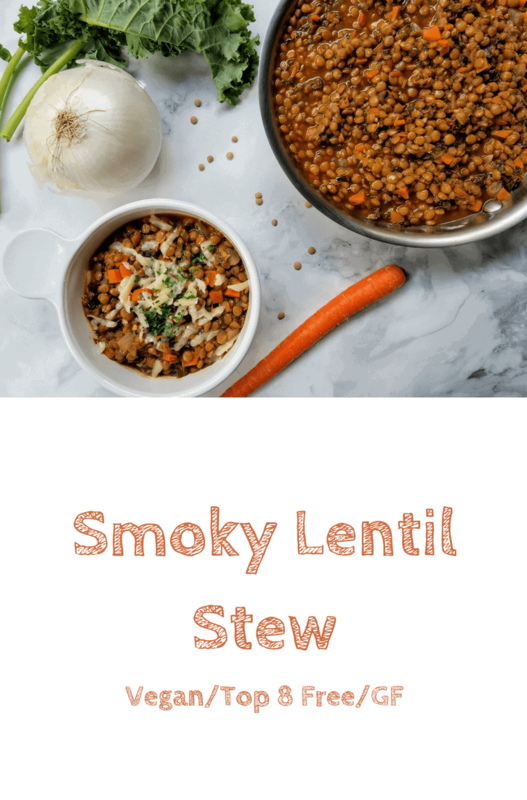 This smoky lentil stew is a healthy and hearty dish. The smoked paprika plays a starring roll. Pair with a roll or biscuit. Heat olive oil over medium heat. 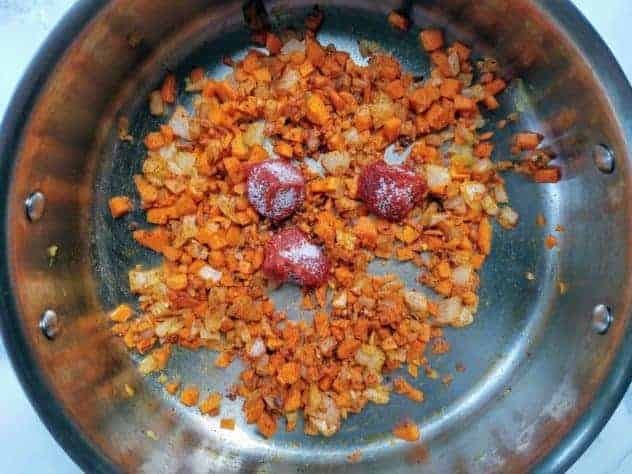 When it starts to shimmer, add the onion and carrots. While stirring occasionally, cook for 5 minutes or until tender. Add the garlic, tomato paste, paprika, cumin, red pepper flakes, salt and pepper. Cook for 1 minute. Add the kale and lentils. Cook for 2 minutes or until the kale looks wilted, stirring frequently. Add in the vegetable broth and water. Bring to a boil, then reduce heat to low-medium and simmer uncovered for 30 minutes, or until lentils are tender. Scoop into bowls and if desired, garnish with bacon and sharp cheddar cheese. I like to top this dish with oven baked bacon and grated sharp cheddar cheese. Credit: Recipe very lightly adapted from Cooking Light magazine. hmm this looks super tasty. Great on a Thursday night whilst watching movies on the sofa. What a yummy looking recipe. 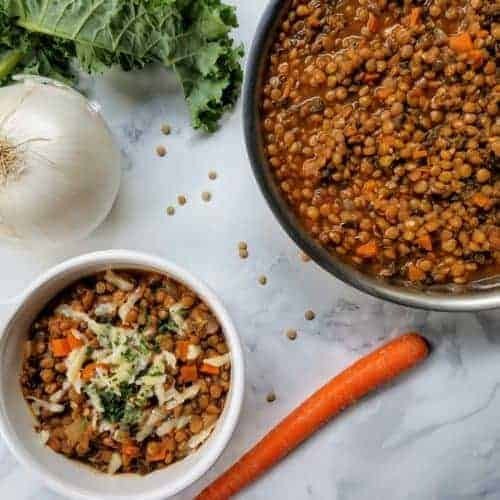 I am usually not a fan of Lentil recipes but I love the sound of yours here. Me either! I don’t even like lentils, but this recipe was really, really good! This looks really good. I am going to have to add this to my recipe book. My hubby like lentils so he is going to like this for sure. Thanks for sharing the recipe. Thank you for sharing this recipe. I like lentils and eat it with rice. Looks tasty.